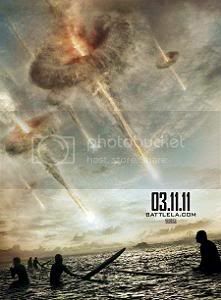 Battle: Los Angeles is not really an alien invasion movie. Well, it is, but more than that this is a war movie. The bad guys just happen to be aliens who are invading. Now that may not exactly come as news to a lot of people - it was fairly well known that a war movie first and foremost was the intent and goal of the filmmakers. But it also happens to be true - they achieved their goal and made a pretty darned good war movie... where the enemy just happened to be from another planet. Writer Chris Bertolini and director Jonathan Liebesman do their best to (rather quickly) flesh out many of the characters early on in the movie. No one character gets a whole lot of fleshing out outside of Aaron Eckhart's Staff Sergeant Michael Nantz, who is almost always referred to as simply, "Staff Sergeant." And even he isn't given a whole lot of rounding as a character. He's still fairly two dimensional - but there is something there to latch on to that makes him seem somewhat real. And then this unexplained, unprecedented meteor shower that has been making the news turns into something darker and more foreboding as the, "Meteors," start landing just off the shore of several major metropolitan areas. We're told that these, "Meteors," have been slowing down just before going into the ocean. Clearly, this isn't good. A live newsfeed off of the Southern California beachline shows the beginning of the attack. Terrified onlookers attempt to flee, but the aliens shoot to kill any human they see. It's at this point that a group of Marines is sent in to Santa Monica to extract survivors holed up in a police station. And that's what the movie is about - this platoon of Marines who are only trying to save a handful of civilian survivors and get them out of harm's way. From then on it is almost nothing but wall to wall action as the aliens are a superior force technologically. But there are some clues given that they can be defeated. The aliens use projectile weapons. High powered, powerful projectile weapons, but guns and bullets all the same. They aren't armed with ray guns and disruptor beams. They are just far enough ahead of us technologically to travel to this planet with some goal in mind. The movie rarely takes the time to breathe. The pauses are relatively brief, and more often than not still loaded with tension. Winning the war isn't the goal, surviving is. 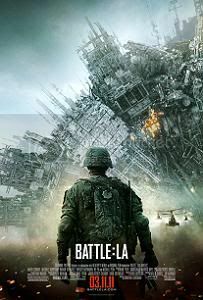 Battle: Los Angeles is an exciting and gripping movie. It's not a great movie, but it is one hell of a ride. As a war movie it works fairly well. As a science fiction movie it also works fairly well. And the two genres are blended seamlessly - making for a fairly believable movie that makes the viewer wonder, "What would I do in that sitation? Could I handle that?" Aaron Eckhart is good in his role as the Staff Sergeant, and the rest of the cast (largely unknown or lesser known actors) does a good job all around of making the viewer believe that this could be happening. The reactions of the characters to the insane situation that they find themselves in ring true. The characters and situations come across as genuine. Liebesman does a fine job of directing the movie with a very realistic, almost documentary like style. There is a real, "You are there," kind of feel to the movie, and nothing that is happening is so outlandish technologically that anything here is hard to buy in to. 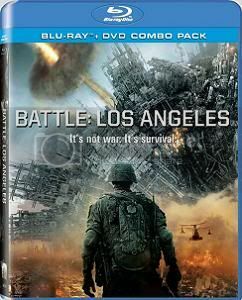 Battle: Los Angeles is definitely a triumph in not only achieving the filmmakers' goals, but in creating an entertaining, thrilling movie that actually exceeds what Steven Spielberg did with his remake of War of the Worlds. It's not a character piece, but it is one hell of an exciting, nerve wracking movie. The blu ray is first rate, too, with excellent picture and sound (well, there's a lot of smoke, but the picture is still very good). The featurettes included are also fairly interesting (yeah, there's a bit of Hollywood promo fluff there, but also some interesting insight into the making of the movie). This is well worth buying if you like either war movies or science fiction movies. If you like both it's a no-brainer. It's not great, but it is intense and it is very good.